No, the absence has been purely vocational. Long work weeks have left little time for anything other than family. No complaints, as I truly enjoy the work, but the blog certainly suffered. With that.. this one has been on my mind lately. Enjoy! In 1930, a local art professor named Elias Garcia Martinez, in an act of gratitude to the little village where he spent his holidays, painted a small mural of Jesus, crowned with thorns, on the wall of the local church in Borja, Zaragoza, Spain. A sweet little old lady, 80 year old amateur artist Cecilia Gimenez, stepped up and attempted to right the long-neglected Jesus. The problem? Senora Gimenez wasn’t a trained artist. And the result? 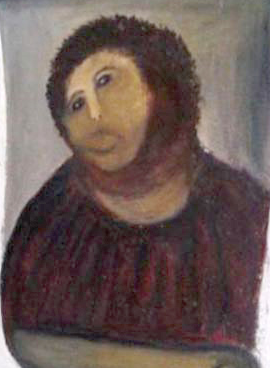 What some have called “Potato Head Jesus”. A man was seeking to find guidance in scripture, so he randomly flipped his Bible open and, with eyes closed, pointed to a scripture and opened his eyes…. “and Judas went and hanged himself.” (Matthew 27). Unsettled, he closed his eyes again, let the Bible fall open, and turned pale as his finger now pointed at… “go and do likewise” (Luke 10). Yes, it’s humorous, but the point is serious; Scripture means what it means and what it means is given to us clearly, in context. You can’t randomly take verses and force them into other context and still be true to scripture. The untrained artist, Senora Gimenez, got the parts right; eyes, nose, hair, tunic.. but goodness, what a mess! 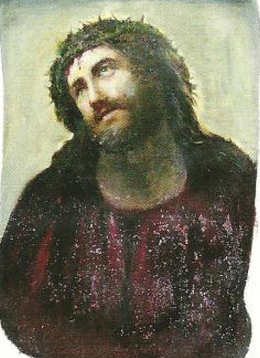 While we ended up with something, it was so far from the real Jesus that it was an unrecognizable, grotesque caricature. In this case, the bible most clearly speaks to this issue in what are known as the “Pastoral Epistles” (that would be a pretty good place to look, no?) What does God the Holy Spirit say through The Apostle Paul in 1 Timothy, where the qualifications for Pastors and Elders are most clearly laid out? “But I do not allow a woman to teach or exercise authority over a man, but remain quiet. For it was Adam who was first created, and then Eve. And it was not Adam who was deceived, but the woman being quite deceived, fell into transgression,” (1 Tim. 2:12-14 — all quotes from the Bible are from the NASB). This passage has several interesting areas of discussion, but for our purpose we will focus on authority. At the very least, there is an authority structure set up by God. The woman is not to have authority over the man in the church context. But this does not extend to the political/economic world. 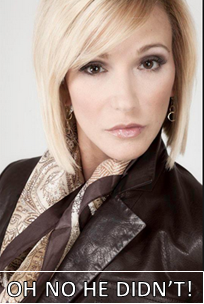 In the Old Testament Deborah was a judge in Israel over men. Also, in the New Testament, Phoebe played an important role in the church at Cenchrea (Romans 16). There is no doubt that women supported Paul in many areas and were great helpers in the church (Acts 2:17; 18:24-26; 21:8-9). But what Paul is speaking of in 1 Tim. 2 is the relationship between men and women in the church structure, not in a social or political context. When we look further at Paul’s teachings we see that the bishop/overseer is to be the husband of one wife (1 Tim. 3:2) who manages his household well and has a good reputation (1 Tim. 3:4-5, 7). Deacons must be “men of dignity” (1 Tim. 3:8). Paul then speaks of women in verse 11 and their obligation to receive instruction. Then in verse 12, Paul says “Let deacons be husbands of one wife…” Again, in Titus 1:5-7, Paul says, “For this reason I left you in Crete, that you might set in order what remains, and appoint elders in every city as I directed you, namely, if any man be above reproach, the husband of one wife, having children who believe, not accused of dissipation or rebellion. For the overseer must be above reproach as God’s steward…” Notice that Paul interchanges the word ‘elder’ and ‘overseer’. In each case, the one who is an elder, deacon, bishop, or overseer is instructed to be male (See article There were deaconesses, so there can be female elders and pastors). He is the husband of one wife, responsible, able to “exhort in sound doctrine and to refute those who contradict” (Titus 1:9). We see no command for the overseers to be women. On the contrary, women are told to be “dignified, not malicious gossips, but temperate, faithful in all things” (1 Tim. 3:11). Why is it that it is the men who are singled out as the overseers? It is because of the created order of God that Paul references (Gen. 1-2; 1 Tim. 2:12-14). This is not merely a social custom that fell away with ancient Israel. Paul is a diakonos (minister) of the gospel (Col 1). So, unless the government is a pastor/deacon, the waiters in Luke and Acts were pastors/deacons, and the servants at the wedding in Cana were all pastors/deacons… we clearly have some more digging to do. And to begin, we use the primary tool… context. Phoebe was a diakonos, a servant. A helper. Which is why every major translation (including those used by congregations supporting female pastorship) translate diakonos as “Servant” in Romans 16:1 (NIV, KJV, ESV, ASV, NASB, HCSB, NKJV). So, do we see any clear teaching in 16:1 as to the role of Pastor? No, and certainly not even an argument as to the use/translation of diakonos here would supercede the sedes doctrinae found in 1 Timothy. 1 Timothy lays out the requirements for a Pastor/Deacon, while Romans 16 simply mentions a female servant/helper in passing. 2. Under Christ, Men and Women are equal! Didn’t Paul say something about, there is no male or female, greek or jew, or something? See? All are in Christ! Bam! The context is clear. Galatians 3 isn’t about Pastoral qualifications, it’s about salvation. In that sense, we are absolutely all one in Christ Jesus! In summary, the case for female pastors must be made from either assuming a particular use of the term diakonos in Romans 16 and taking Galatians 3 out of context. Call me biased, but when I have to one day stand before God and defend how faithful I was with His word, I’m not super-comfortable with that combo. The case for a male-only pastorate is both explicit, and in a context specifically speaking to this subject in both the affirmative and the prohibitive. Prohibitive: ” 12 I do not permit a woman to teach or to exercise authority over a man; rather, she is to remain quiet.” (Galatians 2) In fact, Galatians 2 lays out authority from God the Father, through Christ, for the Church, to the Apostle, to Pastors and Leaders. At the risk of sounding snarky, which position looks like an accurate painting of Christ found in scripture, and which appears to be rough brushstrokes of “nose”, “eyes”, and “tunic”? If someone, ANYONE, makes an assertion, something they say that God says or scripture says, look up what they are saying in scripture and *in context*. If someone is preaching about giving, or who can preach, or who is baptized, or what communion means, I plead with you to look to the scripture for where it most clearly, and most specifically speaks to these subjects. And for your homework… what is it that is “pressed down, shaken together, and running over in Luke 6?” Feel free to post your answers in the comment section, on the marc5solas facebook page, or tweet them to marc5solas! Note: 2 great articles by Matt Slick at CARM for further reading!